American robin, Leesburg, NJ. 2015 by E. Thompson. We did not see robins in winter. Robins form large flocks in winter, and they may or may not be in your area. I now live in an area of southern NJ where huge flocks of robins spend their winter. But I only see them pass over in great numbers in the morning and again at dusk; they don’t visit my garden. In spring they will move north for their summer nesting areas, and my summer robins will return from the south to nest and catch worms in my yard. The American robin (Turdus migratorius), is migratory, hence its name. Migratorius means “to go”. The robins of our backyards in summer are not the same robins we see in winter: if you see any in winter. We just had another snow storm and it was a big one; about 7 inches of snow fell. If you’ve read my previous posts, you know that I love snow. And while I know that many of you are tired of it, I am not. Seriously, I wouldn’t mind if winter stayed for another three months. I am, however, getting a bit tired of the laces on my boots. Anyway, this snowstorm, and the ice storm, and the snow of last week, provided endless opportunities for photographs. I am sure you all have awesome pics of this winter wonderland. So, I will not bore you with yet more wintry, snowy pictures…except for this wintry, snowy photo of a robin. I have had huge unexpected flocks of robins hanging all about my house and yard during and after this storm. They have been lined up along the roof edge, with synchronized bobbing, drinking from dripping icicles. And they have been covering the Juniper shrubs like Christmas tree ornaments, devouring the berries and flinging the snow with their busy wings. Robins prefer to eat worms and other things in the soil, but when they find themselves in an area of deep snow, they will resort to berries. I don’t know if these are the wintering robins that usually remain aloof and overhead, or early migrants that signal the arrival of spring. 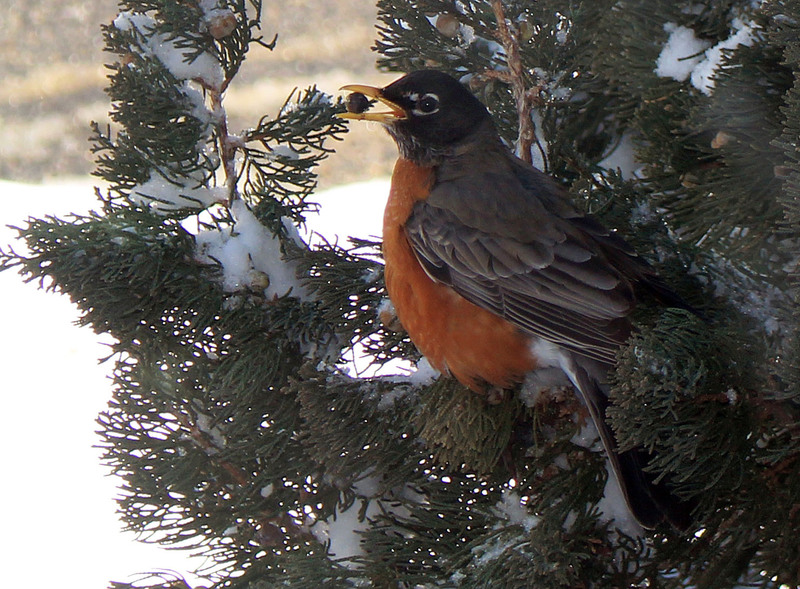 Either way, it’s been a real treat to watch this post-snow behavior of the robins in my yard. Are you seeing robins in your yard? This entry was posted in Uncategorized and tagged robin, spring, turdus, winter on March 6, 2015 by elizabeth.